If you’ve enjoyed these tips and are in the market for electronics or photo gear, using these links to buy from TigerDirect or Amazon.com or alternatively using the PayPal Donate button to make a small contribution helps me keep this site going. Thanks! 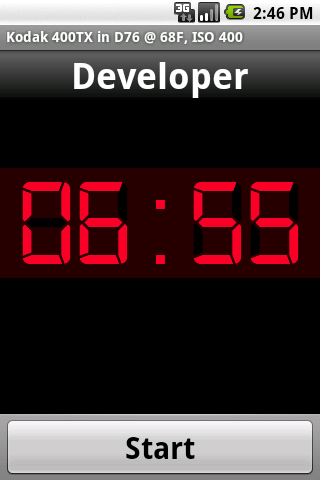 There is a great Darkroom Timer application by Chicken of the Web for Android devices on the Android Market that is really worth a look at. It is a super useful and flexible application that lets you enter your own development recipes and accounts for things like agitation intervals, pour time etc. I’ve been using it for a while now and have a nice set of presets for black and white film developing for this app that I hope some of you might find handy too. You’ll need to get the text file on your Android device either by mailing it to yourself and saving locally or by copying it to the SD card via USB. Drop the text file on the SD card of your Android device in to the folder named com.webkist.android.DarkroomTimer (create the folder if it doesn’t exist). Then fire up Darkroom Timer, hit the Menu button and select Load Presets. On the pop up that appears, just select the preset to load it. If you have any problems loading the file, please leave a comment. Copyright © 1996-2010 astroturtle. All rights reserved.